"Looks like the scene is set to hop," said Lapinette. "Maxo," said the Wabbit in an attempt to sound cool. He poked cables around and made random connections. A deafening whine assaulted their ears. "Woopso," muttered the Wabbit and he made a few changes. "Beep, you dig the beep, Daddy-O!" The Beep was agile for its shape and it advanced on Lapinette. "I'm hip to the Beep," said Lapinette and she stuck out a paw at an awkward angle. The Beep transmitted a rapid series of beeps and asked, "You the chirp?" Lapinette postured and threw shapes. "Get your glasses on!" Beeps streamed so fast they shrilled like a locomotive. The Beep turned to the Wabbit. "Message for you Pops." Up to this point, the Wabbit felt left out. His nose twitched imperceptibly. His ears wiggled. Then he shrugged dramatically. The beeps became musical and played a short tune. "I'm a beepin' out danger," beeped the Beep. "I'm a beepin' out warnin'." 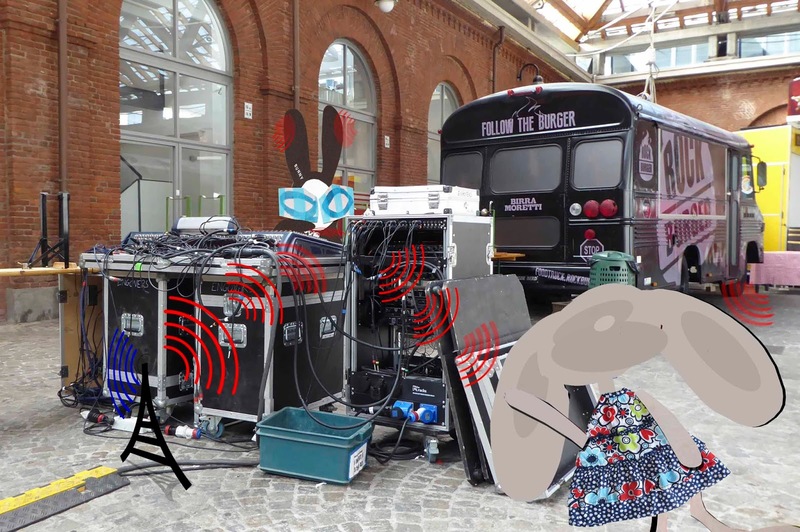 The Wabbit waited some time and the beeps became rhythmic. The Wabbit's question arrived like a hammer. "Why?" "It's my job," replied the Beep. "I'm an alert." "What's the warning for?" said Lapinette. The beeps became slow. "I don't know. You are now alerted. Enjoy the gig." Now they could hardly hear the beeps. The Wabbit made a few adjustments with some success and the beeps strengthened. Then the Wabbit had an idea. "Are you a small. medium or major alert?" The Beep beeped loudly. "Imminent threat ..."